Serve a deliciously beautiful dish with our Red Cabbage Salad. 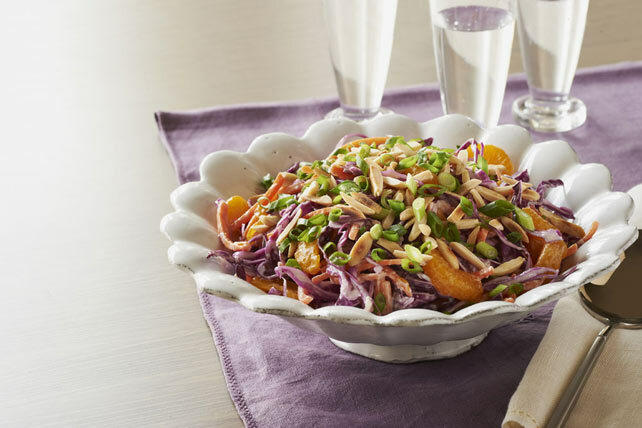 This Healthy Living Red Cabbage Salad features red cabbage, carrots and mandarin oranges! Mix dressing, ginger and sugar until blended. Add to cabbage mixture; mix lightly. Refrigerate 1 hour. Stir in nuts and onions before serving. Substitute 1 sectioned pink grapefruit for the mandarin oranges. You will need to shred about 3 medium carrots to get the 2 cups shredded carrots needed to make this recipe.